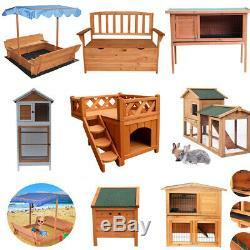 18"20"36"40"48"60"64"65"70"75" Wood Chicken Rabbit Hutch Cage Dog Cat Bird House. Applicable Age Range: 3-8 Years Old 4. Dimensions: (47.24 x 47.24 x 9.45) / (120 x 120 x 24)cm (L x W x H) 6. Weight: 529.11oz / 15000g 7. 1 x Sandbox 1 x Instruction 1 x Non-woven Mat. Dimensions: (47.24 x 47.24 x 47.24) / (120 x 120 x 120)cm (L x W x H) 6. Weight: 599.66oz / 17000g 7. 36 2 Tiers Rabbit Hutch Cage. Dimensions: (36.02 x 17.72 x 32.09) / (91.5 x 45 x 81.5)cm (L x W x H) 2. Weight: 423.29oz / 12000g 3. Material: Fir Wood & Plastic & Asphalt & Welded Mesh 4. Suitable for: Rabbits, Ferrets, and Guinea Pigs 8. Upper Gate Dimensions: (17.05 x 12.80) / (43.3 x 32.5)cm (L x W) 10. Small Door Dimensions: (10.16 x 11.89) / (25.8 x 30.2)cm (L x W) 11. Lower Side Plastic Spray Network Dimensions: (12.99 x 13.78) / (33 x 35)cm (L x W) 12. Front Plastic Spray Network Dimensions: (13.98 x 12.80) / (33 x 35)cm (L x W) 13. Ladder Stand Dimensions: (24.41 x 5.31) / (62 x 13.5)cm (L x W). 1 x Living House 1 x Instruction. 40 2 Tiers Rabbit Hutch Cage. Dimensions: (39.96 x 21.46 x 39.21) / (101.5 x 54.5 x 99.6)cm (L x W x H) 2. Weight: 564.38oz / 16000g 3. Color: Natural Wood Color 7. Suitable for: Rabbits, Chickens, Ducks, and Other Poultry 8. Upper Fence Dimensions: (16.77 x 11.81) / (42.6 x 30)cm (L x W) 10. Small Door Dimensions: (11.57 x 11.61) / (29.4 x 29.5)cm (L x W) 11. Lower Single Door Dimensions: (14.29 x 14.96) / (36.3 x 38)cm (L x W) 12. Side Plastic Spray Network Dimensions: (14.61 x 14.42) / (37.1 x 41.7)cm (L x W) 13. Ladder Stand Dimensions: (27.87 x 6.15) / (70.8 x 15.7)cm (L x W) 14. 36 Single Deck Rabbit Hutch Cage. Dimensions: (36.02 x 17.72 x 27.56) / (91.5 x 45 x 70)cm (L x W x H) 2. Weight: 282.19oz / 8000g 3. Small Door Dimensions: (9.17 x 10.00) / (23.3 x 25.4)cm (L x W) 6. Color: Natural Wood Color 8. Suitable for: Chicken, Hen, Rabbit, Guinea Pig or Ferret 9. Asphalt Roof Color: Green 11. Plastic Spray Network Dimensions: (18.70 x 10.71) / (47.5 x 27.2)cm (L x W) 12. 48 2 Tiers Rabbit Hutch Cage. Dimensions: (48.03 x 19.69 x 40.94) / (122 x 50 x 104)cm (L x W x H) 2. Weight: 705.48oz / 20000g 3. Suitable for: Chicken, Hen, Rabbit, Guinea Pig or Ferret 8. Upper Gate Dimensions: (22.48 x 12.87) / (57.1 x 32.7)cm (L x W) 10. Small Door Dimensions: (11.93 x 14.53) / (30.3 x 36.9)cm (L x W) 11. Side Plastic Spray Network Dimensions: (14.37 x 17.52) / (36.5 x 44.5)cm (L x W) 12. Ladder Stand Dimensions: (31.50 x 4.92) / (80 x 12.5)cm (L x W) 13. Material: Fir Wood & Plastic & Asphalt 2. Color: Natural Wood Color 3. Applicable Pets: Dog, Cat 4. Pets Bed's Dimensions: (45.28 x 30.91 x 31.50) / (115 x 78.5 x 82)cm (L x W x H) 5. Asphalt Roof Color: Green 6. Weight: 705.48oz / 20000g 7. Door Width: 13.39 / 34cm 8. Type: Monolayer Sloping Roof(Roof Can be Open) 10. 1 x Dog House 1 x Instruction. Color: White & Dark Brown 3. Overall Dimension: (20.87 x 30.12 x 64.21) / (53 x 76.5 x 163.1)cm (L x W x H) 4. Upper Left Bird Nest: (17.72 x 14.2 x 21.9) / (45.01 x 36.07 x 55.63)cm (L x W x H) 5. Upper Right Cage: (17.72 x 12.2 x 12.2) / (43.69 x 30.99 x 30.99)cm (L x W x H) 6. Upper Right Cage Door: (7.9 x 9.1) / (20.07 x 23.11)cm (L x W) 7. Lower Cage: (31.5x 22.83) / (80.01 x 57.99)cm (H x W) 8. Tray Size: (25.6 x 16.14) / (65.02 x 41.00)cm (L x W) 9. Feet Height: 5.91 / 15.01cm 10. Weight: 21kg / 46.30lbs 11. Wire Distance: 1 (Not Suitable for too Small Birds). 1 x Bird Cage 1 x Instruction. Total Size: (27 x 24.8 x 65) / (68.60 x 63 x 165)cm (L x W x H) 2. Big Door Size: (11.8 x 17.3) / (29.98 x 43.94)cm (W x H) 3. Small Door Size: (6.9 x 6.9) / (17.53 x 17.53)cm (W x H) 4. Material: Fir Wood & Asphalt Felt & Galvanized Mesh 5. Color: Wood Color & Green. Overall Size: (55.1 x 19.7 x 63.8) / (140 x 50 x 162)cm (L x W x H) 2. Single Door Size: (23.2 x 55.9) / (58.93 x 141.986)cm (L x W) 3. Height Between the Two Pieces of Layer Board: 18.3 / 46.48cm 4. Wood Thickness: 0.39 / 0.99cm 5. Material: Fir Wood & Asphalt Felt 6. Color: Wood Color & Green 7. Weight: 18kg / 39.68lbs. 1 x Storage Shed(Right Door, Laminate, Screw, Manual) 1 x Instruction. Overall Size: (30.31 x 21.38 x 70.47) / (77 x 54.3 x 179)cm (L x W x H) 2. Door Size: (20.3 x 48.2) / (51.56 x 122.43)cm (L x W) 3. Window Door Size: (10 x 6.7) / (25.4 x 17.02)cm (L x H) 4. Three Inside Board Size: (9.8 x 14) / (23.88 x 35.56)cm (L x W) 5. Bottom Floor: (24.6 x 16.9) / (62.48 x 42.93)cm (L x W) 6. Wood Thickness: 0.39 / 0.99cm 7. Material: Fir Wood & Asphalt Felt 8. Weight: 15kg / 33.07lbs. 1 x Shed(Side, Back, Front Board) 1 x Instruction. Wooden Cat House with Balcony. Setup Dimensions: (20.08 x 20.08 x 17.99) / (51 x 51 x 45.7)cm (L x W x H) 2. Inner House Size: (20 x 14.5 x 12) / (50.8 x 38.83 x 30.48)cm (L x W x H) 3. Door Dimensions: (8.5 x 6.7) / (21.59 x 17.02)cm (L x W) 4. Sun Deck Size: (20 x 20 x 5.5) / (50.8 x 50.8 x 13.97)cm (L x W x H) 5. Weight: 5kg / 11.02lbs 8. Material: Fir Construction & Solid Wood & Linoleum & Spray Mesh & Plastic 2. Structure: Living House, Run Backyard, Window, Ramp 4. Dimensions: (61.41 x 20.47 x 26.77) / (156 x 52 x 68)cm (L x W x H) 5. Running Area Dimensions: (31.5 x 22.4 x 20.7) / (80 x 57 x 52.5)cm (L x W x H) 6. Up-door Dimensions: (7.1 x 6.7) / (18 x 17)cm (W x H) 7. Weight: 14kg / 30.86lbs 9. 1 x Wooden Rabbit Cage 1 x Installation Instruction. 50 Rabbit Guinea Pig House. Dimensions: (50.39 x 23.62 x 20.08) / (128 x 60 x 51)cm (L x W x H) 2. Weight: 264.55oz / 7500g 3. Gate Dimensions: (15.75 x 19.69) / (40 x 50)cm (W x H) 4. Small Door Dimensions: (11.02 x 19.69) / (28 x 50)cm (W x H) 5. Interior Arch: Dimensions: (5.91 x 9.06) / (15 x 23)cm (W x H) 6. 61 2 layer Chicken Coop Hen House Cage. Periphery Dimensions: (61.42 x 20.47 x 26.77) / (156 x 52 x 68)cm (L x W x H) 2. Weight: 16kg / 35.27lbs 3. Right Cage Dimensions: (30.71 x 16.73 x 19.69) / (78 x 42.5 x 50)cm (L x W x H) 4. Left Bottom Cage Dimensions: (28.74 x 16.73 x 8.27) / (73 x 42.5 x 21)cm (L x W x H) 5. 75 Two-tier Rabbit Cage Chicken Coop. Material: 0.67" Solid Fir for Main Board; 0.47" Plywooden Back; 0.87"1.5" Solid Fir Leg; Rainproof Roof ; 0.8"1.5" Solid Fir Frame; Rainproof Drawer 2. Whole Size: (74.8 x 26 x 45.7) / (190 x 66 x 116)cm (L x W x H) 3. Egg Cage Size: (13.8 x 17.7 x 25.6) / (35 x 45 x 65)cm (L x W x H) 4. Run Box Hight: (24.8-37.8) / (63-96)cm 5. Painting: Double Water-based 4# Color Painting. 1 x Wooden Chicken Coop 1 x Manual. Weight: 4.5kg / 9.9lbs 4. Overall Dimensions: (20.1 x 16.5 x 16.9) / (51 x 42 x 43)cm (L x W x H) 5. 1 x Wooden Rabbit Hutch 1 x Manual. 30 2-Story Cat Cottage Pet House. Color: Yellow & White 3. Weight: 14kg / 39.9lbs 4. Overall Dimensions: (30.7 x 32.3 x 35.4) / (78 x 82 x 90)cm (L x W x H) 5. Front Upward Window Size: (6.0 x 5.9) / (15.2 x 15)cm (L x H) 6. Front Upward Door Size: (6.0 x 5.9) / (15.2 x 15)cm (L x H) 7. Middle Door Size: (18.9 x 8.3) / (48 x 21.1)cm (L x H) 8. Middle Platform Size: (26.5 x 11.8) / (67 x 30)cm (L x W) 9. Right Door Size: (11.8 x 19.7) / (30 x 50)cm (L x W) 10. Leg Height: 2.0 / 5.1cm. 1 x Wooden Cat Cottage 1 x Manual. 18 2-Story Cat Home with Balcony. Color: Gray & White 2. Dimensions: (17.72 x 17.75 x 25.59) / (45 x 45 x 65)cm (L x W x H) 4. Bottom to the Ground Height: 3 / 7.62cm 5. Upper Balcony Height: 7 / 17.78cm 6. Door Openning Dimensions: (8 x 10) / (20.32 x 25.4)cm (W x H) 7. Product Weight: 5.4kg / 11.9lbs 8. Weight Capacity: 20kg / 44lbs 9. Suitable for: Small Pets of All Ages and Activity Levels. Dimensions: (44.09 x 22.83 x 32.28) / (112 x 58 x 82)cm (L x W x H) 4. Product Weight: 14kg / 30.86lbs. Material: Double Fir Wood 2. Weight: 13kg / 28.66lbs 3. Overall Dimensions (Including the Roof): (50.39 x 19.69 x 34.65) / (128 x 50 x 88)cm (L x W x H) 4. Green Asphalt Roof: Protect Against Winds, Rains and Gale 5. Suitable for: Storing All Kinds of Tools and Accessories, Such as Spout, Spades, POTS, etc 6. Material: Fir Wood & Red Asphalt & Plastic Feet 3. Dimensions: (30.7 x 34.6 x 32.7) / (78 x 88 x 82)cm (L x W x H) 4. Door Openning Dimensions: (12.6 x 14.8) / (32 x 37.5)cm (W x H) 5. 1 x Wooden Dog House. International Buyers - Please Note: a. If you need return, please contact our customer service representative, let us know the detailed problem and send us some pictures for confirmation. If you are dissatisfied for any reason, please do not be quick to leave negative/neutral feedback. We work hard to make sure EVERY CUSTOMER 100% SATISFIED and resolve any problem for you. Work Time: Monday to Saturday. If you are dissatisfied for any reason, please donot be quick to leave negative/neutral feedback. Work Time:Monday to Saturday. The item "18203640486064657075 Wood Chicken Rabbit Hutch Cage Dog Cat Bird House" is in sale since Sunday, March 17, 2019. This item is in the category "Pet Supplies\Small Animal Supplies\Cages & Enclosure". The seller is "hurrytobuy" and is located in Multiple Locations. This item can be shipped to United States.